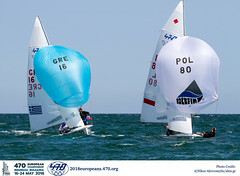 French 470 pair Nicolas CHARBONNIER and Olivier BAUSSET chipped away at Nathan WILMOT and Malcolm PAGE's overall lead on Friday, finishing the day's race in moderate air two places ahead of their closest competition. 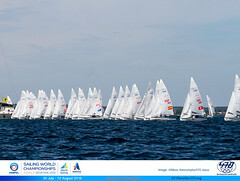 Sailors sailed for the first time in NNE winds that started at 11 knots and faded to 9 knots. 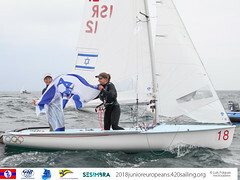 For the second time in the regatta, Tetsuya MATSUNAGA and Taro UENO (JPN) figured out the fickle breeze and led the 27-boat fleet around the course. Sven COSTER and Kalle COSTER (NED) whittled away at MATSUNAGA and UENO's lead but didn‘t have enough runway left in the dying breeze to catch them. Rounding out the top four boats behind the Japanese and Dutch teams were the consistent French and Americans, who are posting consistent finishes keeping them in the top half of the fleet. Overall leaders and world #1 crew Nathan WILMOT and Malcolm PAGE (AUS) came in fifth to maintain their run of all single-digit finishes. They lead on 22 points, five ahead of Nicolas CHARBONNIER and Olivier BAUSSET (FRA), and 21 points ahead of third place Ãlvaro MARINHO and Miguel NUNES (POR). Athens silver medallists Nick ROGERS and Joe GLANFIELD (GBR) drop back to fourth following a “real shocker” 20th place finish today. MATSUNAGA and UNEO and Javier CONTE and Juan DE LA FUENTE (ARG) each have 59 points and are in ninth and 10th places overall, respectively. There is a 10-point gap behind them and a lot of people will be willing to take some big risks to make it into the Medal Race. The final three races of the Men’s 470 Opening Series are scheduled for tomorrow. Source: ISAF / Olympic News Service.